Welcome to the Storming into Giveaways Giveaway Hop brought to you by The Hopping Bloggers! A story that captivate their interest. Maybe it's a character they already love, a favorite animal or a subject that stands out to them, but it has to have something that makes a child reach for it. A story that flows well. If a story doesn't have a natural flow to it, I find my daughter seems to grow pretty bored with it pretty easily. A story that makes sense. I love a story with a good lesson, but it has to be understandable to kids. When kids understand the story, they want to read it again and again. Illustrations that draw them in. That can mean different things to different kids, but personally I tend to look for vibrant color and simple, but captivating artwork. Something interactive is always a plus too. Seems simple enough, right? And thankfully, there are plenty of books out there that fit the bill. Today I am excited to share with you three new board books from Silver Dolphin Books that my daughter has fallen in love with. 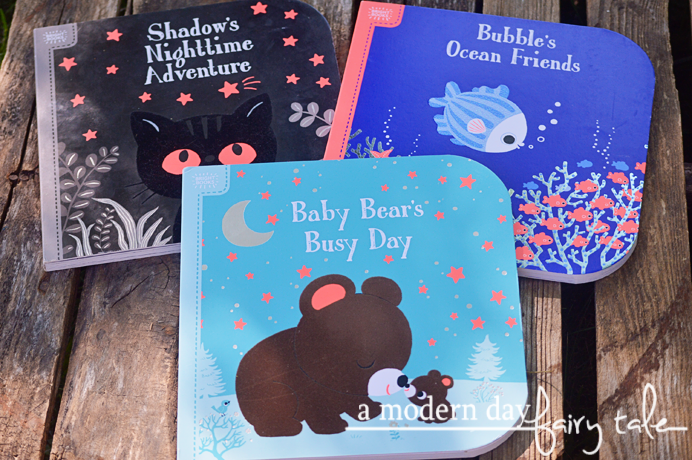 Join a young bear and his mother for their very busy day in the forest with Bright Books: Baby Bear's Busy Day. This visually stunning board book features bright neon elements, soft touch-and-feel bears, and shiny foil that will capture baby's full attention and imagination. With sweet, soothing text and gentle illustrations, this engaging book will become a bedtime favorite. Follow along as baby bear has a day full of fun! Swim along with Bubble in the deep, blue sea in Bright Books: Bubble’s Ocean Friends! Follow Bubble on her adventure and discover turtles, starfish, crabs, and more. Lively rhyming text, bright, colorful illustrations, and shiny foiled details invite young readers to have hands-on story time. Page after page, babies and toddlers will have fun counting all of Bubble's new ocean friends. Shadow is a very adventurous cat, but his favorite time for adventuring is at night. He loves saying hello to the moon, strolling around on rooftops, stargazing with friends, and so much more! Read along and explore the night in this storybook with rhyming text, colorful elements that illuminate the dark, and a soft touch-and-feel cat to guide you through the night. 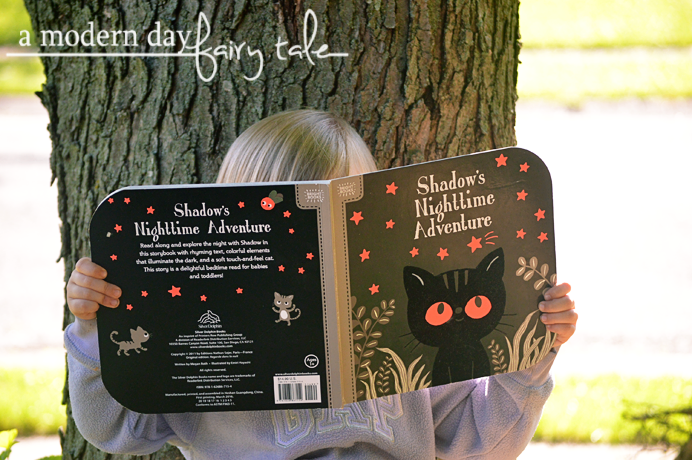 Bright Books: Shadow's Nighttime Adventure is a delightful bedtime book for babies and toddlers. These books certainly had everything we look for in a great children's books. The stories were simple, my 3 year old could easily follow along and pick up on bits and pieces of the story. They're short enough for bedtime reading and/or short attention spans too, which is great because my daughter is certainly a 'one more time' kind of girl. But what I really loved about these particular books was the artwork. Each page only had a few simple colors, but they popped beautifully--- modern and captivating... they used textures like a soft velvety material, metallic and glitter to draw in the eyes--- and the hands for a full sensory experience. They certainly drew me in...and my daughter too. She enjoyed reading them over and over again. Each story is unique and beautiful in its own way, but I think Shadow's Nighttime Adventure was our favorite. It reminded my children of their own pet and encouraged them to read to her too, getting the whole family involved. I would like to take my nephew to see Cars 3. My great grandchildren are looking forward to seeing a couple different movies, so I will take them to the ones that are here in our town!!!! I'd like to see Cars 3 with my mom and grandma! We don't go to movies but will let the children watch DVD's once in a while as a 'movie night'! Despicable Me 3 with my family. The new Despicable Me is a movie that my nephew would enjoy watching with me. These books look wonderful for young readers.